The spine contains 33 vertebrae. Except for the lower one-quarter of the spine, all vertebrae all are movable, or unfused. Each vertebra has two sets of facets joints located on the back of the spine. One pair faces upward and the other faces downward; they link each spinal segment together. The joint surfaces are coated with cartilage so that they glide against each other smoothly. Degenerative disc disease is pathology with unknown cause. Disc aging results in a weakened intervertebral disc, which would normally act as a cushion between the vertebrae. When its mechanical integrity weakens, SpineUniverse.com describes the disc as losing its outer wall strength and developing small defects. As the vertebrae push on the disc, it can herniate its softer inner material through a defect. The herniated material can push against the spinal cord or spinal nerves and cause pain or other symptoms. Degenerative disc disease can have a variety of symptoms, depending on the level of involvement and the degree of herniation. In some cases, pain can be low grade or absent and in others, it can be debilitating. Pain can radiate mostly into the hips and legs and, according to the Cedars-Sinai website, may flare up occasionally and persist for days. Twisting and bending makes the pain worse. In severe cases of disc herniation, there may be muscle weakness in the lower extremity as well as sensory dysfunction. The facets are like other bony joints and can develop arthritis. Facet arthropathy essentially is the pathology of the facet joint and specifically, the cartilage on the facet surface. 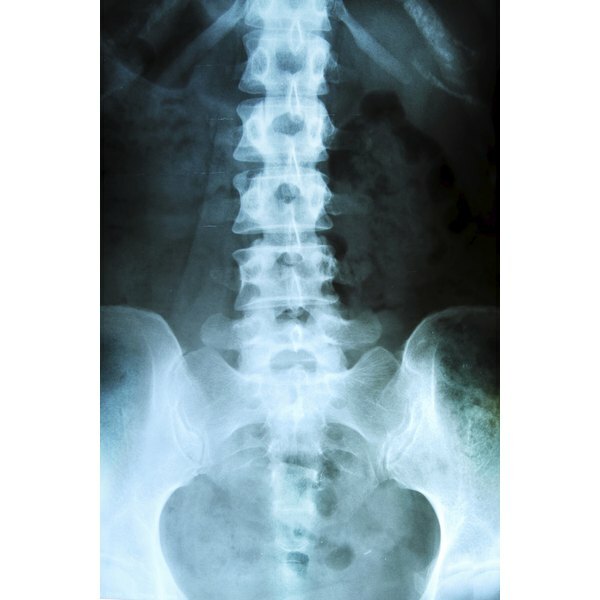 The Spinal Columns website reports that facet arthropathy develops as a result of degeneration, disc problems, bone fractures, prior trauma to the back and torn spinal ligaments. Most people who suffer from facet arthropathy feel low back pain. The intensity increases with extension and twisting motions. According to The Spinal Columns website, it is rare that facet arthropathy alone is the only cause of back pain. Often, sufferers will have back problems that can contribute symptoms. The more common associated problems are degenerative disc disease, bone spurs, spinal stenosis and arthritis in another part of the spine. A degenerated and herniated disc will often cause pain radiating into the buttocks, back and legs. With facet arthropathy, the pain is localized in the affected region of the back. Over time, facet arthropathy can contribute to the formation of bone spurs. Bone spurs can exert pressure on the nerve roots similar to that caused by a degenerated disc. This can produce symptoms of radiating pain, numbness, and muscle weakness similar to that in spinal stenosis. Facet arthroplasty is a procedure usually performed after surgery to the back portion of the vertebrae. According to the BlueCross BlueShield website, it involves the implantation of hardware called a spinal prosthesis in order to restore strength and function to the back part of the spine after decompression surgery. Total facet arthroplasty is a relatively new procedure and is considered an alternative to spinal fusion in patients with facet arthropathy. Spinal fusion results in immovable vertebrae while facet arthroplasty maintains the natural movements of the vertebral bones.